If you are a book lover in Kolkata or any other part of West Bengal or India, your options for reading books are quite limited. The local books stores have a limited stock and they may take days to get you a copy of the book you are looking for. Your next option would be to go to the College Street book stores which is an uphill task during these hectic days and traffic congestion. Your local libraries can stock only a limited number of books constrained by their meager budget. 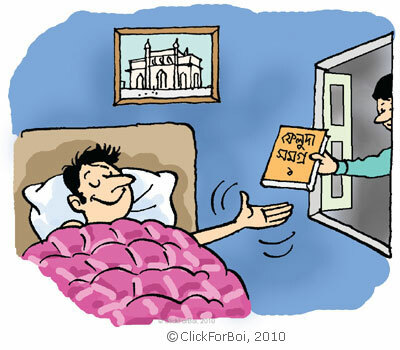 ClickForBoi resolves all that problem by allowing you to get your favorite books online. Imagine Netflix for books, and that’s what ClickForBoi does for you. Book lovers in Kolkata/West Bengal and India can now join this novel subscription service by clicking on ClickForBoi.in . Subscription starts from Rs 199.00 per month which includes as many books as you can read, including delivery and pick-up charges. Once you become a subscriber, you can select books and make your own queue. ClickForBoi will send you books from the queue and once you return it, they’ll send the next one. Unfortunately, this service is available only to readers in India. The creators of Click For Boi also has an online book store named ClicktoBuyBoi.in . This store works in the same model as Amazon.com or any other online book store. ClicktoBuyBoi.in sells Bengali books of all genres and of all authors and their stock keeps on growing. They offer good discounts and their shipping charges are very nominal. For example, a book shipped to Bhubaneshwar from Kolkata was only charges Rs 20.00. However, their shipping is now limited only within India, with plans of expanding and reaching out to expatriate Bengali readers all over the world. But for now, Bangla book lovers living abroad can gift books to their loved ones in India using this site. The site accepts credit cards. And just to add a shameless plug, ClicktoBuyBoi.in also has my book (Natak Samagra) in their stock. Thank you for spreading the word about Clickforboi.in by writing in your blog. We at Clickforboi has started this initiative with a single goal to make available Bengali books in an innovative way to all Bengali readers (starting with India..) and create a community of Bengali book lovers who would not only read / buy books but also share their perspective & opinion about books. Also, wanted to add couple of points to your post about the site ~ the monthly subscription at Clickforboi.in allows reading either 2 books/month or 4 books/month based on the plan reader selects. We do not have unlimited delivery plan yet but would certainly explore this as we grow the membership. Next, we have very recently launched the Free Home Delivery service at our bookstore (www.clicktobuyboi.in) anywhere in India! So there are no more shipping charges to be borne buy the reader over and above the book price. We would run Special offers periodically to provide additional discount on certain books as well. We earnestly hope with this feature book lovers will be benefited more and Bengali books will have wider reach. Does this mean, with the 2 books/month plan, a subscriber can 2 books only a month, or he can keep two books at a time like the way Netflix does for movies? ALthough reading two books a month is an ardent task, but for some fast readers they can read more. If 2 books/month is a hard limit, what happens if I read 1 book a month? Do I get an extra book the following month? An excillent website though I wonder if the clickforboi initiative will be benificial.While reading the plan is good but could suffer drastically becauese of long keeping time,hence the availability chain might be disrupted. Once again buying the book might be a better idea altogether.Now coming to the part of buying,there is also another site http://www.boimela.in which is also offering similar service but is in market for a longer period of time.I myself have ordered from the site and was really surprised at the delivery timings.